The Writing Bug: Can I Buy a Bowel? Can I Buy a Bowel? Did you find the mistake? I don’t know about you, but if I were to make a list of medical services I'd rather not have my toilet provide, elongating my bowel would be right up there with liposuction and an emergency tonsillectomy. Because I tend to overthink these kinds of things, I got to wondering what could possibly explain the error, as a hand-written mistake cannot be shrugged off in the same manner as a printed typo. Was it possible that the sign-maker didn’t know how to spell bowl? I certainly hope not and prefer to explain the extraneous e as the oversight of an anatomy student who was up late the night before studying for a test about the gastrointestinal tract. It seems equally impossible that I am the only shopper who noticed. If that’s the case, did the employees leave the sign up as a laugh for the compulsive proof-readers of the world? Or did they shrug it off as unimportant enough to correct? Not that hardware folks don’t have a sharp sense of humor, but I’m assuming the latter. I know there are a great many people in the world at large who don’t worry about the effects of a misplaced letter, but I am not one of them. I respect the power of a single letter. One letter can change bowl to bowel and bowel to vowel. It can alter context and meaning in hilarious and disastrous ways, even without the 'help' of the well-meaning but often-clueless autocorrect. If you do not have a sharp eye and find that even after proofreading you have a case of--well, in the spirit of today's post let's call it loose vowels (too much for a Monday morning? I wasn't sure)--enlist someone to help you. You'll be glad you did. How are you at proofreading? Have you found any embarrassing mistakes in your work? Ah, I love a laugh-out-loud moment first thing in the morning. 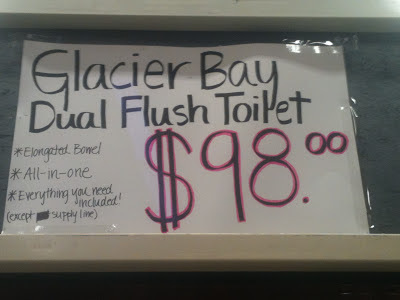 It's a pretty funny slip considering it's an advertisement for a toilet...almost as if done on purpose. I giggled for a long time on that one. On purpose? I don't know. I am not the best at proofreading, especially my own work. I do remember being extremely grateful when a writer friend had noticed I wrote pubic instead of public in a press release I was ready to send. Oh my gosh, that's hilarious! An elongated bowel...that sounds uncomfortable! If it were me who saw the sign, I'm sure other shoppers across the store would hear me laughing. I'm not a great proofreader, but it does drive me nuts when signs in stores have "your" when it should be "you're" or "it's" when it ought to be "its." I laugh at my own faux pas because I enjoy laughing at others. I came to a stop line in a parking lot in Houston, TX with the yellow letters laid out: S P T O...but I stopped anyway. Hilarious! I always believe it's a good idea to have at least one set of eyes review things before they go out, but sometimes I don't get it done. I fancy myself an pretty good proofreader because my father and grandfather were newspaper editors and I did some proofreading at the Lusk Herald as I was growing up. And there was hell to pay from my father if I missed something!